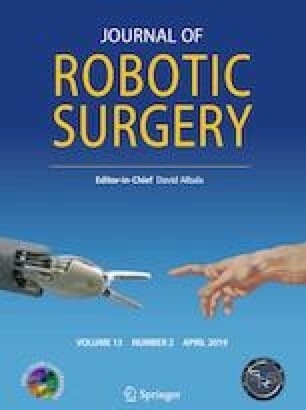 The objective of this article is to present our experience with the 3-mm instruments using the Senhance surgical robotic system in gynecological and abdominal surgery from July to December 2017 by a retrospective observational study. All patients who underwent a robot-assisted 3-mm laparoscopic procedure with the Senhance surgical robotic system were enrolled. Two separate populations were involved: nine female gynecological patients and five digestive surgery patients. Five cholecystectomies, three annexectomies, four ovarian cystectomies, one myomectomy and one endometriotic nodule resection were performed. For the gynecological cases, the median time spent at the console was 37 min (12–77), while the total duration of the intervention was 81.33 min. All the interventions were performed on an outpatient basis. There were no postoperative complications. The average visual analog scale for pain (VAS) was 2.11 (± 1.91) on D0. For the abdominal surgery cases, the median time was 39 min (21–64). The average total duration of the intervention was 87.4 min (± 36.82). One of the five interventions was performed on an outpatient basis. There was one laparoscopy conversion. No postoperative complications in the 2 weeks following the operation. There are few 3-mm instruments available with the Senhance surgical robotic system, which limits the number of interventions. However, it is possible to perform gynecological interventions with 3-mm instruments on an outpatient basis in complete safety. It is possible to perform cholecystectomies by pairing the use of 3-mm and 5-mm instruments. The recent arrival of new 3-mm instruments will enable a wider range of surgical indications. We are grateful to Paula Harry for English revision and editorial assistance. J. Montlouis Calixte, B. Ripamonti, G. Barabino, T. Corsini, C. Chauleur declare that they have no conflict of interest and nothing to disclose. All procedures followed were in accordance with the 1964 Helsinki Declaration and approved by the ethical committee institutional. Informed consent was obtained from all patients included in the study.